I’ve been seeing a lot of people struggling with issues with their dog, yet they still won’t start a daily training habit. I’m really not sure why. If it’s that you feel you aren’t good enough, you are WRONG. 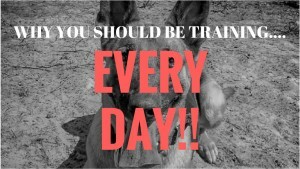 ANYBODY CAN TRAIN THEIR DOG!! You are perfectly capable of achieving success, you just have to start! If it’s that you don’t have the time, well……you shouldn’t have a dog. When you are done watching the video, be sure to click HERE to learn how to get started TODAY with your training. I have put together step by step instructions to take out all of the thinking. You have no excuses!